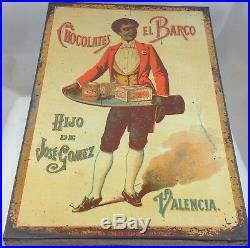 This rare large candy tin from Valencia, Spain features a handsome man carrying a tray of packages featuring the company's products, coffee, tea, chocolates... Size in inches: about 11 by 7 and 1/2 by 2 and 1/2. 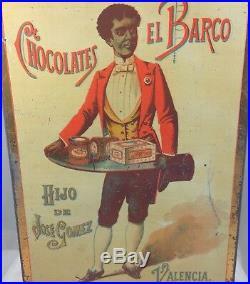 Condition: Good, the pictures tell the full story, some minor wear and tear. 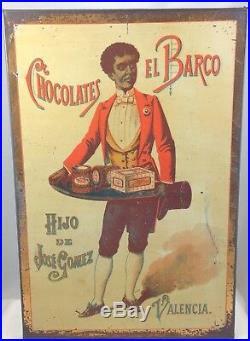 I specialize in all forms of antique advertising. 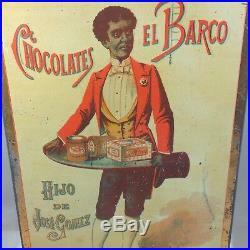 Don't forget to look at my other listings. 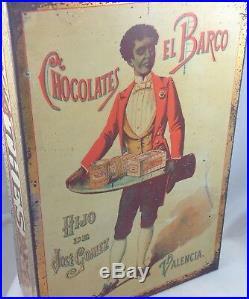 The item "CHOCOLATES EL BARCO RARE LARGE CANDY TIN SPAIN c1905 BLACK AMERICANA" is in sale since Tuesday, March 28, 2017. 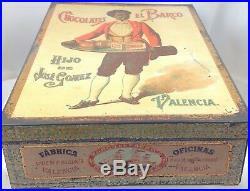 This item is in the category "Collectibles\Advertising\Merchandise & Memorabilia\Tins". 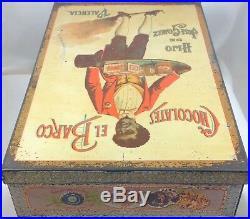 The seller is "huxtins" and is located in Reedsville, West Virginia.